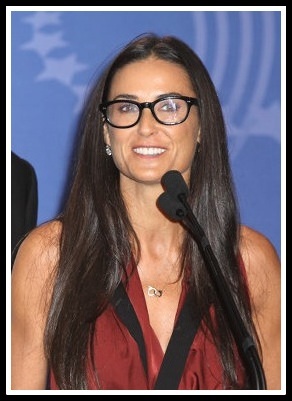 Let's learn how to choose an eyewear frame that best compliments a SQUARE face. If you do not already know your face shape, click here to find first. A square face is almost equal in length and width. Forehead, Cheeks and Jaw, all have the same width, so the sides of the face are like two parallel lines. The jaw bones are prominently visible on each side of the face. This is called a square jaw. If you have all the above features of a square face, but your face is much longer than it is wide, then you have a long square face i.e. a Rectangular face. To balance your square jaw: Concentrate on frames that highlight the upper portion of your face. Optional: You may want your square face to look longer and slimmer. OR you may want your rectangular face to look shorter. You can go for any of the basic shapes shown on the left side above and see which one looks best on you. There is a huge variety available in the market for each of these shapes. If you want to add sweetness to your face, go for Round or Oval frames, as they soften the angles in a square face. 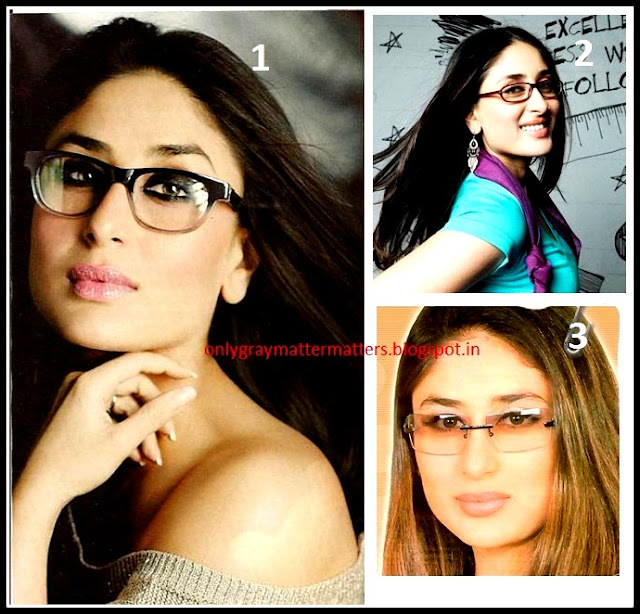 Oval Frames (for spectacles) also make your face appear longer and slimmer. They look okayish to good but not so great. Butterfly and Cat eye frames draw the attention to the upper face and balance your square jaw. They make you look very stylish and enhance your personality. Rectangular, Square or geometric frames as they accentuate the angles of the face, which we don't want. 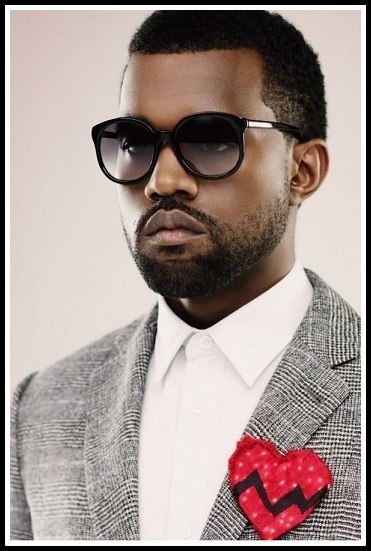 Avoid rimless as they keep your look neutral and don't add much to your personality. Avoid frames with a linear (straight line) top bar which can make you look stern. Avoid frames with arms/temples attached too low as they will emphasize your lower face. 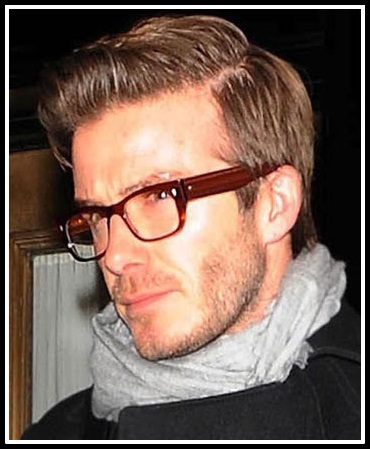 What's wrong with David Beckham's glasses here? The frame is thicker and darker at the top and if you pay attention, there are silver studs at each top corner. All these accentuate the upper face, which is good. But still his frame looks more rectangular than curved and it is making his face appear very stern. The upper rim of the frame is almost covering his eyes. Eyes should actually be in the center of the frame. Frame 1: It's looking just fab, adding oodles to her personality. The frame is curvy, the upper frame is heavy and the prominent upper edges of frame are balancing her square jaw. Her smokey eye makeup is further grabbing the attention to the upper face. Everything is perfect! 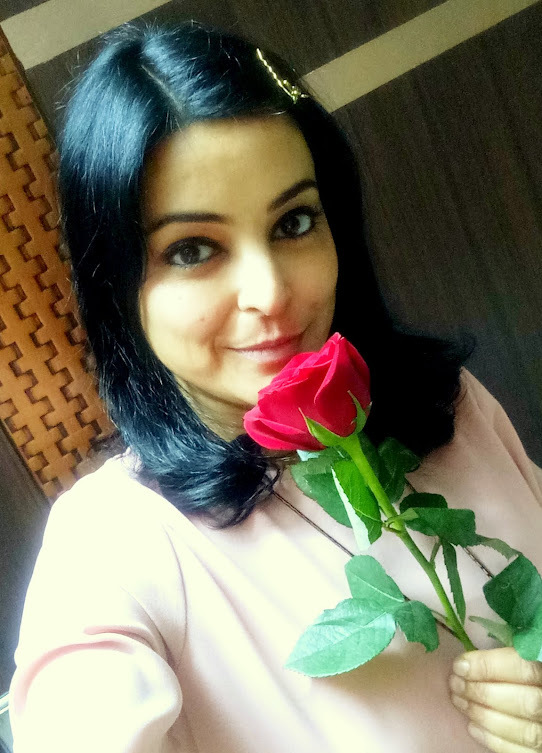 Frame 2: She is looking sweet in an oval frame. The small height of the specs is fine for her small face. Not looking bad but not adding much to her personality either. Just okay! 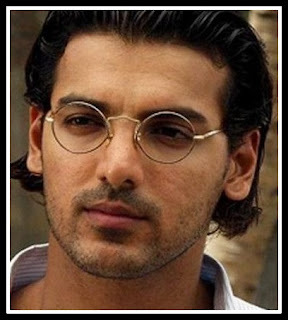 Frame 3: Rimless and square shaped glasses. Keeping her look neutral but not doing anything to enhance the face. Again, not so great! For Sunglasses, oversized frames are an exception as they look good on every face shape. So for a glamorous look, you can safely go for oversized frames. For spectacles, choose a frame that is in proportion to your face. 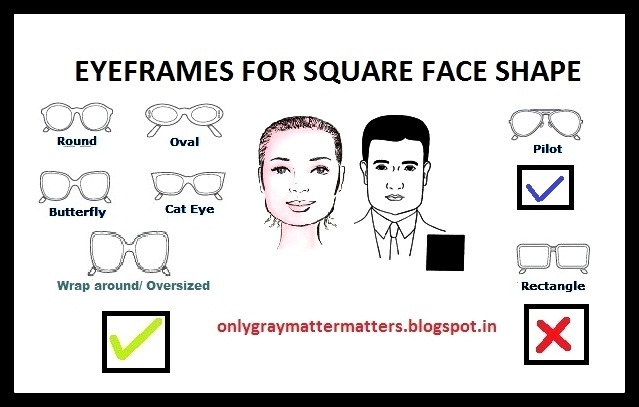 Small face: Small size frames (make your face look longer). Big face: bigger size frames in proportion to your face. Long square face people (also called rectangular faces) look good in longer glasses. 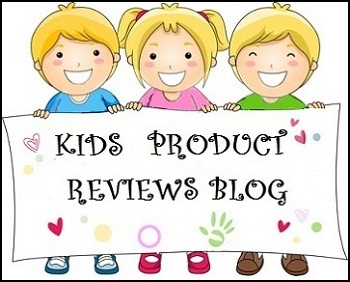 When we say long or small, we are talking about the length/height of the frame. What's wrong with these glasses? 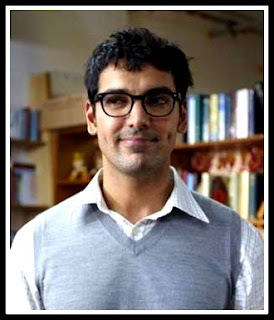 In this example, John Abraham's round glasses look good on his square face. Eyes are in the center. BUT, the frame is too narrow for his face. The frame width ends exactly at the end of his eyes. See Paris Hilton in this PERFECT pair of Sunglasses. Oversized butterfly frames with thick upper edges, pointing upwards like a cat-eye frame. The lenses are gradient - dark brown color on top and light brown towards bottom. Avoid sunglasses with color emphasis on the lower side as that will rather enhance your lower face, which you don't want. (W) Kareena Kapoor, Sandra Bullock, Sushmita Sen, Kristin Scott, Shannyn Sossam, Brooke Shields, Angelina Jolie, Paris Hilton, Kara Tointon, Jacqueline Fernandez etc. (M) David Beckham, Brad Pitt, Nick Lachey, Arnold Schwarzenegger, Matt Damon, John Abraham, Sanjay Dutt etc. Just do a Google Image Search for these celebrities. Check their pictures to study which sunglasses and eyeglasses look good on them. It will help you a lot when choosing one for yourself. 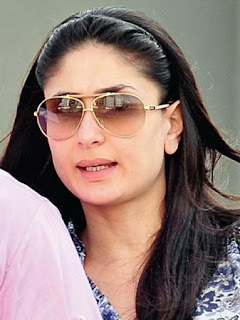 If you are a square face-shaped female, just search on 'Paris Hilton Sunglasses' and you will find numerous perfect examples of what frames to go for. 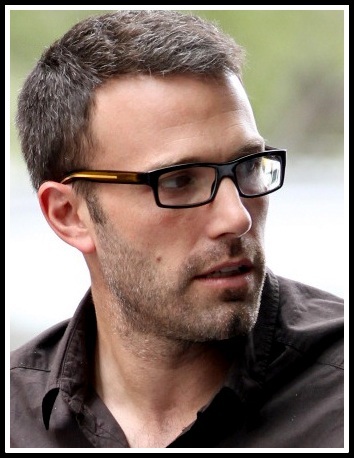 Ben Affleck has a rectangular face and still the shape of his eyewear is not in contrast with his face shape. The frame is rectangular and also small in height. This is accentuating the angles and the length of his face but still he is not looking bad in these. The lighter colored frame-arms/ temples are making his side profile look good but his face may actually be looking too long from the front view. So these guidelines are just to help you choose what may look better or best on you and what to avoid. Still it is all about your personal choice. You need to feel happy and confident in whatever you choose, whether you follow these guidelines or not. Kareena has a prominent square face and aviators look perfect on her.